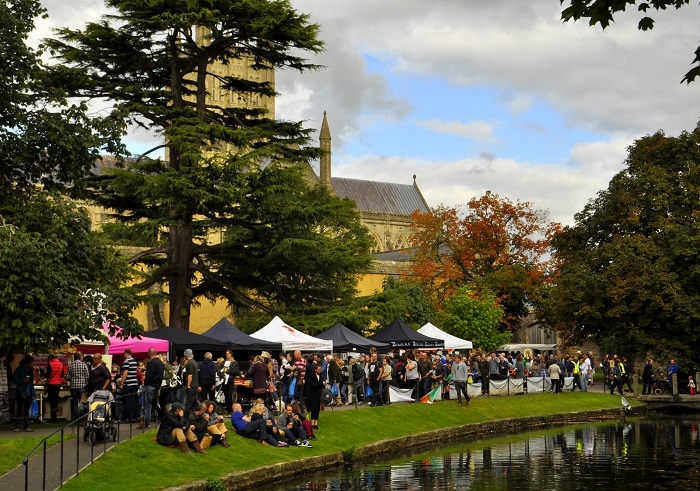 MORE than 15,000 people are expected at what will be the sixth Wells Food Festival, taking place on Sunday, October 14, from 10am to 4pm. There will be food and drink to enjoy from more than 150 producers and street food sellers in the Artisan Market, where visitors can expect to taste their way around the world with everything from chai to mead, Moroccan nut butter to traditional Somerset cheddar. For the first time, The Royal Bath & West of England Society will have a Farmyard Area at the festival. Chief executive Rupert Cox said: “We hope the visiting public will be able to participate, not just spectate. Preparations are going well for Sauerkrautathon, the unique Guinness World Record attempt taking place in Bishop’s Palace Park during the food festival. Organisers Jo Webster and Katie Venner are inviting people to join them for a mammoth session of chopping, salting and bashing cabbage, turning it into the largest dish of bacterially fermented cabbage – sauerkraut. Alongside the record attempt, there will be the chance to taste some of the tangy ’kraut while listening to speakers talking about the importance of gut health, and explaining why eating more veg in general and tangy, fermented veg in particular is so important to staying healthy, both physically and mentally. Guy Watson of Riverford and Love Island DJ Alana Macfarlane Kempner are among the speakers. Chopping slots can be booked in advance at sauerkrautathon.com. Entry to the event – and to the festival – will be free. • 11am-12.30pm: Open debate: It’s time we talked about local food, Wells Town Hall. The debate has been organised by Wells Food Festival and the team behind last year’s bid for City of Culture. Confirmed speakers include: Rupert Cox, CEO of Royal Bath & West of England Society; James Small, a livestock farmer and the South West NFU regional chairman; Steve Mewes, policy and campaigns manager at Somerset Wildlife Trust; and James Simpson, co-founder of Somerset Charcuterie. Doors open for the debate at 10.30am. • 1pm and 2.30pm: Food photography workshop, Wells Town HallLearn the tricks of the trade, behind-the-scene tips and basic camera workings to achieve visually appetising conte. nt with food photographer Neil White and food stylist Helen Upshall at two separate free workshops. • 11.30am-3pm: Soapbox, The Discovery Zone, Recreation Ground. Using the starting point “Did you know?”, guest speakers will take to the festival’s Soapbox throughout the day for a series of informal and informative talks. The line-up includes Paddy Gordon, Shepton Vets, on “DYK… what dairy cows eat”; Jon King, a local poultry farmer, on “DYK... that chickens can lay blue eggs?” and seaweed expert Sandi Coulson from Ebb Tides on “DYK…that eating seaweed can have many benefits to your health?” An updated schedule will be displayed on the day.